From July 11- 25th, 2008, CNS Sweden was host to three programs falling under the theme of “Building Neohumanist Futures.” Education for Sustainable Development and Neohumanist Futures (July 11-14), Building a Neohumanist University (July 16-18), and Yoga Educators Conference (July 20-25). Over the course of these two weeks, in the overwhelming fresh nature of the pine forests of Ydrefors, participants shared their skills and knowledge, and clarified visions for a Neohumanist based future society: What do we have already? What future do we want to create and by what means will we get there? These events featured presentations, audience participation, open space networking, meditation and yoga, blending intellectual, practical and contemplative space to foster innovative and creative educational approaches to the pressing issues of our global community. The theme for this segment of the conference was: How can educational systems and institutions respond to the challenges posed by the current rapidly developing global environmental, economic and social crises and the related psychological fallout? The conference, hosted jointly by the College for Neohumanist Studies (CNS, Ydrefors), Swedish Institute (SI) and Global Action Plan (GAP, Stockholm), attracted 40 participants from 26 countries. The joy of meeting each other from different corners of the world and exchanging thoughts on possible futures was very exciting and productive. The first program was facilitated by Dr. Sid Jordan and Marcus Bussey and assisted by Mirium Sannum, Marilyn Mehann Mehlmann and Ole Brekke, and utilized Open Space technology which created a lively participation of all present. Everyone was alert and challenged to contribute their best ideas and experiences. Agneta Ottander from Stockholm also gave an inspiring welcome address to the international participants. In the first part of the conference, papers were presented. Marilyn Mehlmann and Marcus Bussey presented together comparing ESD and NHE and with audience participation a common understanding of what a ’sustainable, neohumanist society’ emerged. One universal family working collectively and fruitfully for the holistic progress and development of all creatures. The closing session summarized the educational responses to the original three areas of crises and all participants voted to prioritize the action plans of each of these teams. The one with the strongest support from participants is a proposal for a joint development program between two organizations, GAP and NHE. The plan is for them to collaborate to create sustainable development curricula for schools and thus try to reach a greater number of people. The concept is to combine the NHE teaching skills and world-wide network of cooperating schools with GAP’s methodology and competence in ESD, to develop a two-year curriculum of Learning for Sustainable Development, initially for school grades 3 and 4. A close runner-up for prioritized development work was Theatre in Education, subject of two group sessions led by Ole Brekke, director of the Commedia drama school in Copenhagen. In the end, the most enriching aspect of the conference was the enormous wealth of educational experience brought by participants. The Open Space format allowed everyone to present their own work and their own questions to a highly motivated and qualified audience. The evenings featured project presentations by Thailand and Haiti representatives, Didi Ananda Anuraga and Vishvashanti as well as a musical, cultural exchange of extraordinary quality and dimensions. Open Space Technology was created in the mid-1980s by organizational consultant Harrison Owen . Open Space conferences have no keynote speakers, no pre-announced schedules of workshops, no panel discussions, no organizational booths. Instead, sitting in a large circle, participants learn in the first hour how they are going to create their own conference. Anyone who wants to initiate a discussion or activity, writes it down on a large sheet of paper in big letters and then stands up and announces it to the group. After selecting one of the many pre-established times and places, they post their proposed workshop on a wall. When everyone who wants to has announced and posted their initial offerings, it is time for what Owen calls “the village marketplace”: Participants mill around the wall, putting together their personal schedules for the remainder of the conference. The most basic principle is that everyone who comes to an Open Space conference must be passionate about the topic and willing to take some responsibility for creating things out of that passion. “If you find yourself in a situation where you aren’t learning or contributing, go somewhere else. “This law causes some participants to flit from activity to activity. Owen rejoices in such people, calling them bumblebees because they cross-pollinate all the workshops. He also celebrates participants who use The Law of Two Feet to go off and sit by themselves. He dubs them butterflies, because they create quiet centers of non-action for stillness, beauty, novelty or random conversations to be born. 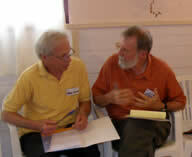 Open Space conferences are particularly effective when a large, complex operation needs to be thoroughly reconceptualized and reorganized — when the task is just too big and complicated to be sorted out “from the top.” On the assumption that such a system contains within it the seeds of everything that needs to happen with it, Open Space provides it with an opportunity to self-organize into its new configuration. For this to work, however, the system’s leaders must let go of control so that true self-organization can take place. The Neohumanist University will address the needs of all the sectors of human living and society, through the academic programs of its Colleges. The University’s primary vision is to contribute to the development of an enlightened neohumanist society. The first four are already running and the fifth has been initiated. This was a time for all interested to make a move towards realizing the dream of a Neohumanist University (NHU) and develop a vision and plan. It was also a time for activating different faculties of AMGK. Already, some work has been done by the faculty of Neohumanist Education and the faculty of Yoga and Intuitional Science. This was a time to consolidate these and other new faculties. Priority voting in the closing session presented a three way tie with Women’s Studies, IT Coop and Microvita all receiving priority interest. 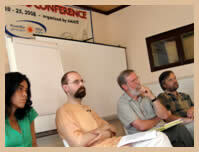 One over-arching vision that emerged from the NHU Conference was the need to build Neohumanist inspired institutions. In this way, neohumanist ideas can be disseminated throughout the various disciplines of human life. These institutions will serve to develop our knowledge, content, curriculum, etc, and to spread Neohumanist inspired thinking into the different spheres of human existence. They will function as stepping stones towards the long-term vision of a complete Gurukul University campus. AMGK has a relationship of cooperation and support with Master Units in all parts of the world. These institutions can be developed in collaboration with research groups and educational training programs in mutual cooperation with the development of Master Units or community service projects through the continuation of relevant conferences and educative programs; and through cooperation with other service or education oriented organizations. • Co-ordination between NHE and GAP. • The formation of a College of Women’s Studies emerged in the collective gathering. A working group has been formed and their plan is to develop a on-line diploma course as a start. • Ongoing coordination and follow-up of working groups that sprouted during the conferences. 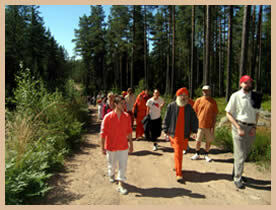 The day before the Conferences began, the new Ananda Marga Gurukula building, on the Ananda Vihar Master Unit in Ydrefors, Sweden, was inaugurated. 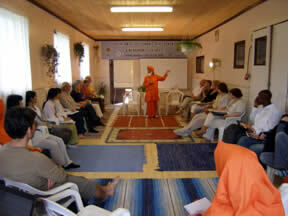 All three conferences took place in this new building which houses a conference hall, office, library and yoga hall. 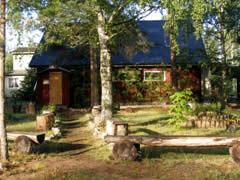 • IT-Training cooperative (incorporated as a part of the Sweden TC). • Drama School in cooperation with Commedia School in Copenhagen. • Construction of a larger hall, in the form of a dome, to facilitate larger meetings and conferences. • Development of the Ananda Vihar Master Unit, to serve as an example of sustainable development practices (sustainable energy sources; farming, etc), and a site for practical training. This six day conference coordinated by Ac. Vishvarupananda Avt. and Ac. 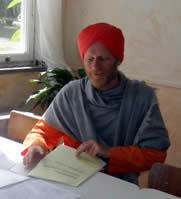 Shankarsananda Avt. was well attended by over 70 individuals interested in expanding their knowledge of teaching yoga and the intuitional sciences. This was a continuation of the successful program held the previous year that included various topics on Yoga and related sciences and practical Asana classes. Further work will be undertaken on educational training programs called YIS (Yoga and Intuitional Science). About 75 experienced yogiis attended the six-day conference. Some key note speakers and workshop leaders included: Dr. Shantatman, medical doctor, Dr. Ward Ashman, clinical psychologist and musician, Kamaleshvar, naturopathic doctor, Trond Overland, psycho-synthesis consultant, Ac. 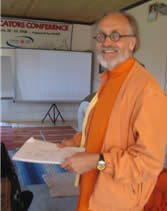 Vishvamitra (Sid Jordan), psychologist, ; Ramesh Bjonnes, scholar and author of tantra and tantric history, Manotosh, specialist in Patanjali’s yoga sutras, Dada Vishvarupananda, Didi Ananda Ragamaya and Dada Shankarsananda, globally reputed yoga instructors, and others. 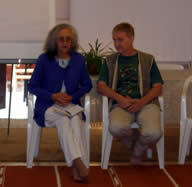 Kusum (Italia) again coordinated the yoga classes this year. 2. Yoga: Past, Present & Future – Putting Yoga History, Current landscape and its evolution in perspective. 3. Science behind Yoga- Warm ups & Asanas: How they work, how they benefit; what dangers are there in each asana-practice. Safety of asanas-practice. 4. Mano-Vijinana (Science of Mind) and Psycho-Spiritual Therapy: what works and why? 5. Science behind Meditation Practices: What works , how and why ? Science of Bio-Psychology in light of latest brain-research. 6. Yogic Life Style & Its rationale: sentient diet, fasting, science of nutrition, self-massage, yogic dances, science behind sixteen points & what they do and why? 7. 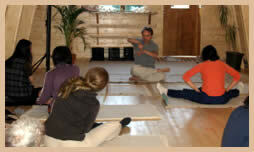 Yoga Therapy and Treatment of Common and Special Diseases. Is Yoga a panacea? When and How? 10. Microvita- a scientific revolution and impact on yogic science. 11. Pedagogical/ Policy Issues related to Yoga-Teachers-Training of Rajadhiraja Yoga. 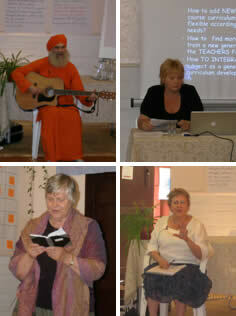 Standards of Yoga Teaching & Role of Excellence in our teaching. Mudras & Bandhas Lab : Share what you know. Cutting edge Research Lab: What do we know more than we knew before, say from a decade earlier. What still needs to be researched? Yogic Treatments & Natural Remedies Lab: Further Insights? Many thanks go to Dada Harikrpananda and the trainees of the Sweden Training Center for their many months of labor behind the scenes, building and renovating and preparing the grounds. And during the events for their loving accommodation and care and cooking for all the many guests that attended these three events.